BIAFRANS TO THE BRITISH GOVERNMENT: "WE ARE NOT INTERESTED IN BBC IGBO SERVICE, ALL WE WANT IS THE FREEDOM OF BIAFRA"
Biafrans worldwide are categorically making it clear to British people that the greatest support they can offer to Biafrans is to speedily facilitate the freedom of Biafra. Freedom of Biafra is our greatest priority, our genuine heart desire which must be fulfilled come what may. We want Biafra freedom and nothing else for that is the only way our lives can be complete. It is high time the world understood that the only thing that interests Biafrans the most is the freedom of Biafra and nothing else. As a matter of fact it is either we get Biafra freedom or we all die on the process. 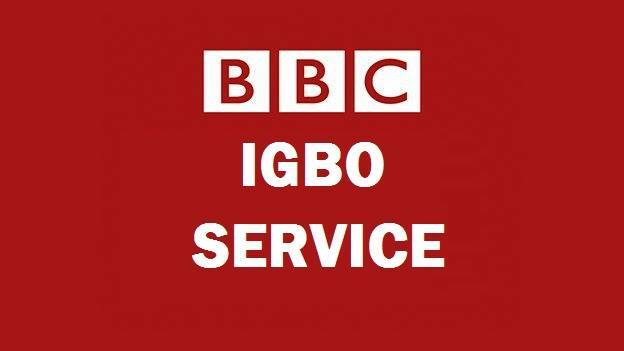 The children of Half of a Yellow Sun (Biafrans) who have grown to a full moon troubling the kingdom of darkness called Nigeria are not in anyway interested or joyed over the establishment of "BBC IGBO SERVICE" which is supposed to be " BBC BIAFRA" if the intention of its establishment is actually for good. Biafrans already have a viable media outfits that are projecting our interest and telling our stories and as such do not need any other media. Biafra freedom is a true and genuine heart desire of her people. The only language we understand is Biafra freedom. The only thing that gladdens the hearts of Biafrans is the voice that preaches the restoration of Biafra. However, British government has over time oppressed and still persecuting Biafrans till date. Britain maimed and massacred our forefathers, raped our women and subjected us to all forms of slavery during the precolonial era and in 1967-70. Britain made away with lots of our valuables and historical data, ranging from Bronze, Terracotta, wooden and stone carvings and even till date still taking our resources especially valuable minerals like crude oil, gold, silver, aluminium amongst others. For evidential fact, most of the outlined valuables like carvings, bronze, terracotta etc are still found and are available in most British museums. In 1967-70, the British government led by Harold Wilson alongside the Nigerian government led by Gen. Yakubu Gowon conducted a genocidal war that led to the death of over 4.5 million innocent Biafrans using hunger and starvation as a weapon of war. 1. Britain should pressure the Nigerian government to produce the leader of IPOB, Mazi Nnamdi Kanu, who got missing after the Nigerian Army raided his home, massacred innocent Biafrans and invariably took him and his parents to their detention camp. 2. Mandate the Nigerian government to release all IPOB members detained in various detention facilities across Nigeria. 3. Mandate the Nigerian judicial system to untag IPOB as a terrorist organization because we are not and foster justice for all Biafra cases in the Nigerian courts. 4. Recognize Biafra genocide, add it to the world genocide record and ensure that General Yakubu Gowon, Harold Wilson and every other person who participated in the said genocide are brought to book. 5. Mandate the Nigerian government to fix a date for Biafra referendum or possibly declare Biafra a free nation. 6. Lobby countries of the world especially the world power countries to support Biafra freedom and possibly declare Biafra freedom and sovereignty from now till March, 2018. If Britain can swallow their pride and meet up to the above stated demands, then Biafrans will consider giving a listening ear to whatever they want to say or do for us.